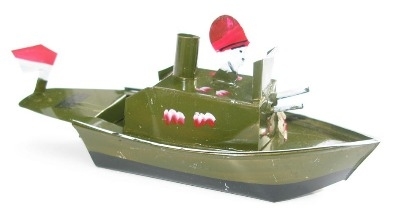 Indonesian Pop Pop Gun Boat - Dark Green. A hand-made tin model featuring moving guns. The back of the guns rest on the diaphragm engine causing a rapid up and down movement. These boats run using olive oil soaked into the cotton wool.